The Alma Accent system comes in a variety of configurations, including the popular Alma Accent Ultra laser machine. 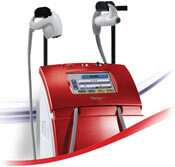 This system is one of the most effective on the market for laser lipo and body contouring. It features the unique IN-Motion technology for maximum patient comfort, and it requires no consumables or disposables. SunrayLaser.com has used Alma Accent Ultra equipment for sale at the lowest price you will find anywhere. Not only do we deliver quality used cosmetic laser machines at a low cost, but we stand behind everything we sell with a total satisfaction guarantee. The Alma Accent Ultra has earned high marks from both patients and providers, as it offers pain-free and non-invasive treatments that are cost-effective and easy to administer. Don’t let the high cost of new laser lipolysis equipment keep you from adding a new revenue stream to your business. Let SunrayLaser.com help you save money on a used Alma Accent Ultra laser system. To get a no obligation price quote on a pre-owned Alma Accent Ultra laser machine, simply fill out the contact form below. Even if you are just comparing cosmetic laser system prices and not ready to buy right now, we are happy to provide pricing information on any model in our extensive inventory.